For the last two years we’ve posted spring recipes for shad roe, a seasonal reward for surviving winter. We’re still rolling with roe this year, but of a dramatically different kind: Spaghetti with Bottarga, Preserved Lemon and Chilies. Bottarga is the salted dried roe of gray mullet or bluefin tuna. Grated over pasta or served in very thin slices, it may be even more of an umami bomb than garum. Until recently only Americans fortunate enough to travel to Sicily, Sardinia or parts of Calabria were likely to encounter bottarga. But about ten years ago lumps of bottarga began showing up in a few American chefs’ hands. Its rich, funky flavor provokes either love or hate, but at twelve to fifteen dollars an ounce, it’s pricey enough to keep all but the curious or committed from seeking it out and trying it. Two ounces is more than enough for pasta for 4. Be forwarned: the curious have a way of morphing into bottarga zealots after their initial taste experience. Think guanciale of the sea. Armed with a small amount of bottarga and prep so rudimentary it makes bolognese look like a kidney transplant, you can make a pasta dish fit for the gods. I like fresh cod, but I LOVE salt cod, especially like this: Brandade de Morue with Olives, Peppers and Arugula. Brandade is what the French, who love adding cream and shallots to everything just to see if anyone’s heart explodes, is what happens when the children of Gaul get their mitts on some morue (salt cod). It has a rich satisfying flavor without being overwhelming, a great texture, and is terrific with uncomplicated red wines. Successful marriages have been based on less. It’s a standard in our house–we eat it by special request (birthdays), on Christmas Eve, and whenever somebody says, Gee, it’s been awhile since we’ve had brandade. 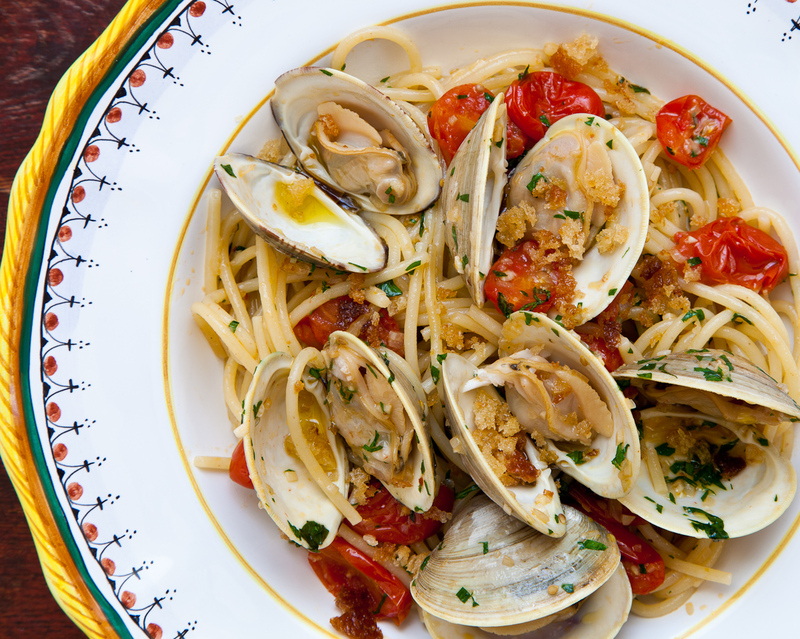 Spaghetti and Clams with Toasted Bread Crumbs takes its inspiration from two dishes–spaghetti alla vongole, a dish of string pasta with clams popular in Naples, Rome, wider Campania and farther north along the Italian coastline; and pasta con il pangrattato, pasta with breadcrumbs, a very basic dish of la cucina povera, the cooking of the poor. At its most elemental the latter contains no more than pasta, breadcrumbs, oil, salt and a bit of garlic. Variations include raisins, cauliflower, anchovies and olives, which is to say that a little stale bread, some pasta and oil is all you need for dinner–if you have anything else you can dine in the lap of luxury.